Elevated levels of atmospheric dust, remnants of a recently abated southern hemisphere regional storm, lingered over most of Mars this past. At high southern latitudes, the perennial south polar ice cap had reached its minimum summer configuration. While in the northern lowlands, the seasonal receding north polar cap edge could be observed under a mixture of dust and water-ice clouds associated with the north polar hood and eastward propagating polar vortex. 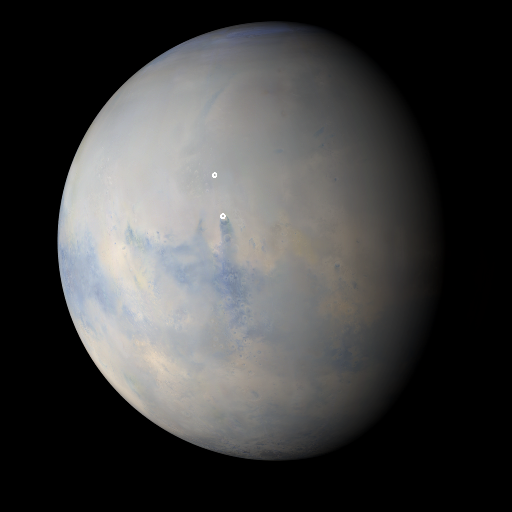 Each afternoon, the Tharsis Montes and other areas in the tropics were free of water-ice clouds. This was due to warmer conditions driven by the elevated levels of dust suspended in the atmosphere. Robotic exploration sites, Gale Crater (Curiosity), Endeavour Crater (Opportunity), and Elysium Planitia (InSight) encountered elevated atmospheric dust levels throughout the week. Malin, M. C., B. A. Cantor, A. W. Britton (2019), MRO MARCI Weather Report for the week of 21 January 2019 – 27 January 2019, Malin Space Science Systems Captioned Image Release, MSSS-563, http://www.msss.com/msss_images/2019/01/30/.